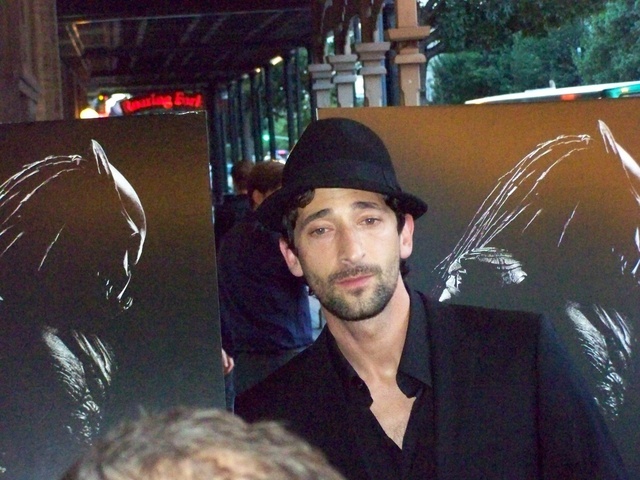 Adrien Brody looks rather sullen in this pic taken from the Austin premiere of Predators, but he has no reason to be: the latest entry in the Predator series has garnered great buzz (okay, maybe not critically, but it’s tracking well)…and so have all the other major releases. 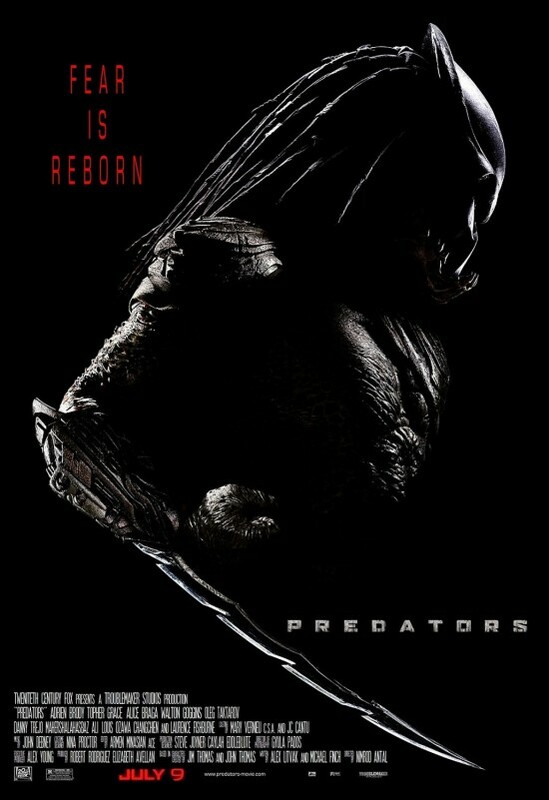 Robert Rodriguez produced Predators, with Nimrod Antal on board as director (yes, that’s his real name). Other than Brody, the cast includes Laurence Fishburne, Topher Grace and Alice Braga (I Am Legend). I think there’s something just very unique about that movie. For one, just look at the movie itself. And something that inspired me to do mixed genre pictures later, was that I remember going to see it with my older brother, who was a bodybuilder, and who saw every Arnold Schwarzenegger movie that came out. And went to see that one thinking it was a Commando type film and then it starts turning. I remember the audience reaction in the theatre. They were kind of confused when it turned into sci-fi, and horror. And Arnold didn’t really win at the end. And sort of the alien blows up…the Predator blows himself up and flies off at the end like he’s going to the Looney bin, With the helicopter…. And everyone’s like, “Wow, what was that movie?” And it just caught on, and caught on, and it kept growing in popularity. Yep, people love them some evil, malicious aliens. “After 23 years and three attempts, Predators finally delivers a solid sequel to the Arnold Schwarzenegger B-movie classic. Following more or less directly from the original Predator, this amounts to a reasonably clever mash-up of Survivor, Lost, The Dirty Dozen and The Most Dangerous Game, among other genre exercises. “The early scenes, shot primarily in Hawaii, are spacious and expansive and nicely paced without becoming frantic. When the story relocates to the Fishburne character’s grimy, claustrophobic domicile, the movie turns static. The filmmakers may have been going for an Alien industrial-grunge vibe, but the tension just isn’t sufficient. Some genre movies simply work out this way: Whatever their intentions or origins they percolate for about an hour. And then they sputter and hope that a promising first half will be enough to get by. In September, Rodriguez will be back with his own genre mash-up, Machete. The latest animated 3-D kids pic, Despicable Me, produced by Universal and Illumination Entertainment, has arrived to try and capture some that sweet Shrek and Toy Story money. It is the first feature-length release for the directing team of Pierre Coffin and Chris Renaud and features the voices of Steve Carell, Jason Segel, Russell Brand and Julie Andrews (last seen in the horribly bland comedy, The Tooth Fairy). The plot centers on a devilish schemer who learns to lighten up after meeting an adorable trio of orphans. 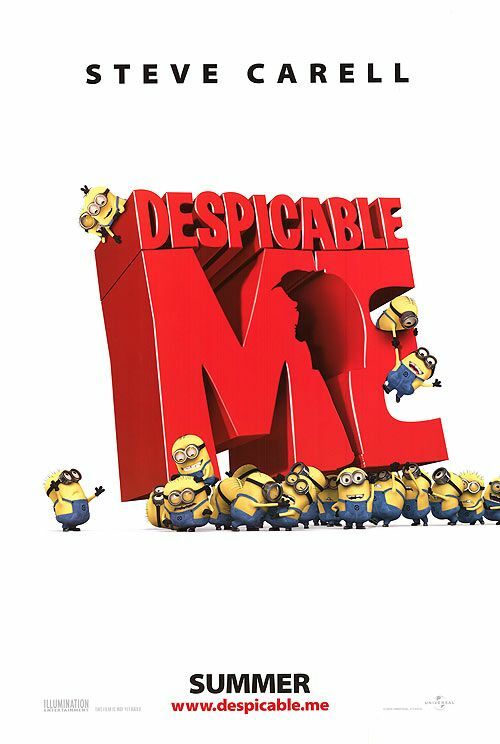 “There’s nothing to despise and plenty to celebrate about Despicable Me. A whip-smart family movie that makes inventive use of the summer’s ubiquitous 3-D technology is something worth cheering. Though not as moving as Toy Story 3, this irreverent comedy-adventure demonstrates that Pixar doesn’t have a stranglehold on clever and heartfelt animated features. The movie is funny in a prefabricated way, heavy on razzle-dazzle and light on soul. You’ll probably leave the theater smiling, but don’t expect to be emotionally engaged, Pixar-style. You’ll be tickled, not touched. Okay. We get it — Pixar for president! 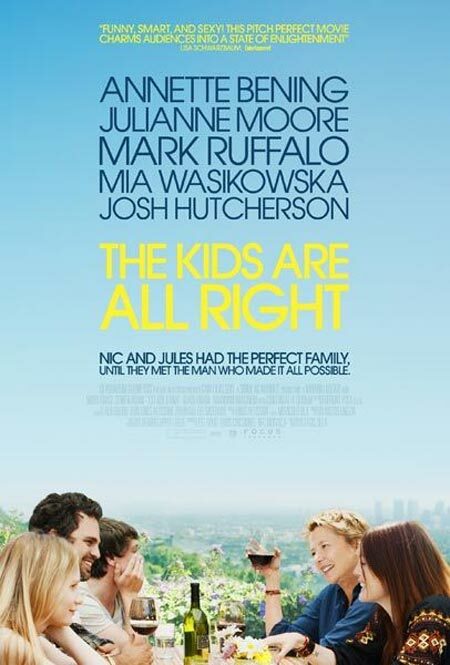 The big indie opener this weekend is The Kids Are All Right, from writer/director Lisa Cholodenko (High Art, Laurel Canyon). The film, co-written by Stuart Blumberg, is a dramedy about a lesbian couple (Annette Benning, Julianne Moore) who finally get to meet the sperm donor (Mark Ruffalo) who’s responsible for their kids (Mia Wasikowska of Alice In Wonderland, Josh Hutcherson of Journey To The Center Of The Earth). A romantic love triangle ensues. “I had recently moved from New York back to L.A., where I’m from. My girlfriend was walking through the hall [Wendy Melvoin, formerly of Prince And The Revolution], and we were talking about having a kid, and how would we have a kid? And would we do it with a friend, and blah blah blah. And we got on the highway to doing it with an anonymous sperm donor. That seemed like the best bet for us, because we really didn’t have a friend that seemed like the right fit. You know, we were just kind of in the whole process of figuring that out, and starting to look for one, and researching it and going online and the whole machinations of “How do you have a kid with a vial of sperm you bought from the sperm bank? How do I pick that? Who is this person?” I took it really seriously. Along the way, Ms. Cholodenko somehow blends the anarchic energy of farce — fueled by coincidences and reversals, collisions and misunderstandings — with a novelistic sensitivity to the almost invisible threads that bind and entangle people. The performances are all close to perfect, which is to say that the imperfections of each character are precisely measured and honestly presented. The basic joke here, and it’s a rich one, is that the dynamics of gay marriages differ little from those of straight marriages. But that joke also serves as a catalyst for some startlingly beautiful considerations. The Kids Are All Right centers on a lesbian marriage, but is not about one. It’s a film about marriage itself, an institution with challenges that are universal. Either way you spin it, the film is one of the best reviewed of the year (which doesn’t say much considering that Little Miss Sunshine and Juno also held that title once), but still — it’s something to see.